NIMHANS Online Pattern MCQs of 2015 March & May 2015 re-exam, 2016 Post-MBBS & 2016 Post-MD included. 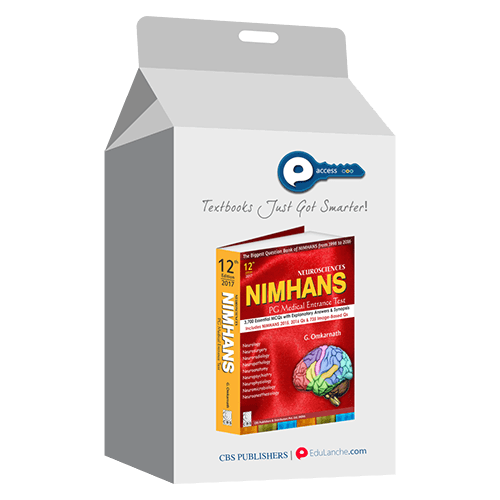 735 Image-based NIMHANS Pattern Questions fully coloured are provided with utmost clarity. 3,700 NIMHANS Pattern Previous Exam Questions thoroughly revised, updated from 19th Edition of Harrison's Internal Medicine, and 26th Edition of Bailey & Love's Surgery. MCQs were arranged year-wise in each subject from 1998-2016. Explanations are provided precisely in bullet form and tabulated form incorporating only high yielding and with relevant facts. Repeatedly asked Questions and their essence incorporated in a highlighted important points in nutshell. More illustrations are added to understand better in the difficult topics. Necessary Mnemonics for faster learning are added.